Mats dislodge and scrape off dirt. Use at any level of foot traffic. Interior entrance mats dislodge soil and absorb moisture and grease. Utilize mats in other areas where coffee, food or grease spills may occur. Place hard vinyl floor mats under desk chairs where the constant rolling of the wheels can damage the flooring underneath. Have walk off mats at every entrance and vacuum them daily. Ten vacuum passes over the first 10 feet inside doorways will remove most tracked-in soil. 80% of the soil brought into a facility can be trapped within the first 12 feet after stepping onto a carpeted surface. In other words, by placing a 12 foot mat at your entrance, you will eliminate 80% of the soil brought into your office. 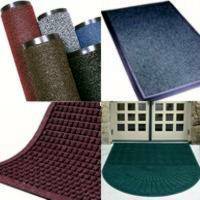 Walk-off mats reduce the need for costly maintenance such as carpet cleaning. By having long enough mats and performing frequent vacuuming, you can prolong the time between labor-intensive carpet cleanings. During dry weather conditions, 1000 people can be expected to track a total of Â¼ lb. a pound of dirt per day into a commercial building. It just makes good sense to keep that in one place instead of all throughout the facility. For dirt tracked from outdoors or from construction renovation within the facility, consider scraper mats with the capability of scraping and holding a larger volume. Getting dirt and contaminants out is especially important in food processing areas and healthcare settings. Increasing safety affects workers and insurance rates. Reducing dirt and moisture that may cause slips and falls demonstrates concern for all who enter the building. Accidental falls count for about 21 percent of annual hospital emergency room visits. Slips and falls account for nine percent of all fatal injuries and 33 percent of hospitalized injuries. Two-thirds of these falls occur at floor level. During wet weather conditions, 12 times more moisture and debris is tracked into buildings. If your work area is already prone to moisture, adding mats can mitigate the problem. Drainage holes in flow-through mats channel away aspills that may lead to accidents. Applications include schools, colleges and universities, airports, grocery stores, hospitals and healthcare facilities and any high-traffic area where safety is a factor. Being green saves green. The estimated cost of removing a pound of dirt from a building can exceed $500. Therefore the more dirt and moisture captured in a mat, the less time and money is spent collecting and removing it. Damage to flooring and finishes is minimized, reducing overall maintenance and renovation expenses. Choosing mats that look better for longer periods and require fewer resources to maintain are part of managing a green facility. Safety may also affect insurance rates. During winter months there is a significant increase in slips and falls and more than 10 percent of claims reference words like snow, rain and ice. Healthier interiors include better Indoor Air Quality. In addition to reducing slips and falls, reducing dirt and contaminants means better indoor air quality. Fewer replacements reduce waste. Mats engineered for longer service cycles over a longer period mean less maintenance and fewer replacements per mat as well as less waste for the planet. Mats with patterns obscure stains and spills while meeting the design criteria demanded for the buildingâ€™s brand and community image.